I know, I already wrote quite a few posts about Savoie and its wines, more especially the whites, over the last few weeks; but I couldn’t resist writing another post about it after tasting the following wine. In a previous post about Eugène Carrel et Fils (read it at www.ledomduvin.com/2009/07/2008-eugene-carrel-et-fils-jongieux.html), I wrote about their Jacquère that I really enjoyed and which rapidly became one of the benchmarks of the store for its quality/price ratio and its exquisitely charming and thirst quenching attitude. Boasting enhancing acidity and crispy minerality in a delicate, elegant and almost pure way, like drinking the icy water of a mountain spring, the Jacquère from Eugène Carrel et Fils is surely one of the best contenders, in my opinion, for this summer most successful white in the store (once again, it already happened last year in July 2009). I love it so much that I couldn’t spend another Spring-Summer without it and decided to order it again. About 4-5 weeks ago, we ordered a few cases and they were gone so fast that I needed to reorder it immediately. However, to my surprise and after waiting patiently for about a week, we still hadn’t received the 2nd order. The wine wasn’t available. The importer was waiting for another container still at sea. How could they do that to me? My customers were harassing me nearly every other day about it: so, did it arrive yet? You’re out of this wine that you suggested me the other day? What to do? What to answer? They were almost striking in front of the store with billboards and slogans… What could go worst? A few weeks earlier before we sold the last bottles, my boss, who is also in charge of counseling recently engaged customers about wines and spirits for their wedding (on appointment only, talk to Matthew at www.HeightsChateau.com), had open a bottle of Jacquère from Eugène Carrel et Fils and suggested it to some customers for their wedding. They liked it so much that we had to order it for them (and for the store of course). And you know what… Murphy’s law! That’s what! Their wedding weekend was pointing on the horizon and we were waiting for the arrival of the wine with great anticipation the week just before the wedding week. Our sale rep. (from the distributor) let us know that the wine was still at sea and would not be here on time… Aïe! Aïe! Aïe! (Que fallait-il faire ou dire pour avoir ce vin?…de quoi en perdre son Latin). However, we are survivor and a solution had to be found ASAP! We could have suggested another wine from Savoie, but the ones that we had in the store at the time were great but more expensive and slightly different in taste; and the customers were counting on us with that wine. Our sales rep. from the distributor told us that he had a few cases left of a “Roussette de Savoie” from the same producer that was worth trying and suggesting instead of the greatly awaited Jacquère. FYI: “Roussette de Savoie” is an “Appellation d'Origine Contrôlée” (AOC) for white wine produced mainly in the western part of Savoie wine region, in France. 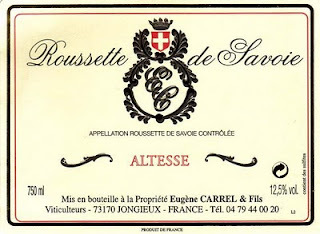 “Roussette de Savoie” is usually and mainly crafted with the eponymous Roussette grapes (also called “Altesse”) sometimes blended with Chardonnay (up to 50% depending of the producer and the desired final product) for the AOC only. For the AOC mentioning the name of the village or the name of a specific vineyard, (thus bearing the "cru" designation, i.e. : Frangy, Marestel, Monterminod and Monthoux), “Altesse” must be the only grape, no blending permitted. These "cru(s)" benefits of the best conditions and the best microclimates, producing greater, even age worthy, wines. 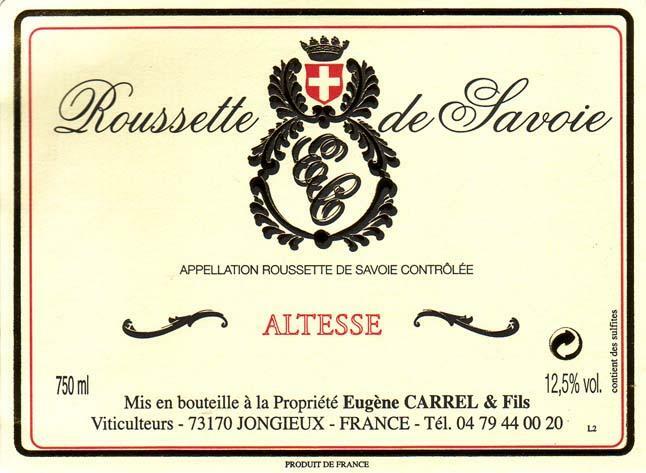 Well, we didn’t think twice, if Carrel could craft such a great Jacquère, his “Roussette de Savoie” would surely make a great substitute. So we ordered it. Wow! What a nice surprise! This wine was a fuller and even more food friendlier version than its sibling Jacquère. To compare it (even if not the same grape I know), in the glass, the robe of the Roussette is slightly deeper, yet still pale yellow-white color, with bright pale golden reflects, although not as translucent. The nose expresses similar notes with lot more minerals, white and yellow fruits aromas. It is also fresh and crisp with delicate scents of white flower, wet stone minerality, citrus and especially white fruit. The palate is very inviting, cleansing and very well rounded. It expands nicely in the mid-palate with a gentle way of coating the entire palate with even more minerals and white-yellow stone fruit. The soft and lingering finish is refreshing and extremely satisfying, and definitely calls for another glass. Greatly enhanced by a lovely mineral touch and great acidity, this high elevation vineyards’ Roussette, like the Jacquère, is an anticipated summer white and as much a food complement as a thirst quencher, particularly in very hot day. I love it too. Although not as bright, light and crisp as the Jacquère, as it shouldn’t be anyway, this Roussette de Savoie is rather supple, rounded, mineral and refined. Yet one thing in common with the Jacquère, is that one bottle won’t be enough if you share it during a late afternoon aperitif or even if you sip over some oysters, shellfish and grilled white fish. Due to its deeper and more complex feel, this Roussette should be paired with more complex dishes like fish in sauce, poultry, chicken and even veal or pork. Thanks to the all team at Eugène Carrel et Fils for making such great wine (once again)!